It occurs to me that many of the people who frequent this Blog would be interested in one of my favorite things, i.e. Habitat for Humanity. Not to be bragging, but I am probably up to 75 houses that I have worked on in some fashion or other over the years. A few more and maybe I will learn how to actually build a house. Let me tell you about it. The system is pretty typical around the country. A corporate sponsor or group or individual comes forward and offers the money needed to purchase the land and the building materials. Then the sponsor or group will collect volunteers (that’s you, Pilgrim) to come and actually do the construction work. In my local Chapter, we look for about 30 to 35 people per day on the site, and we schedule about ten days to complete a 1400 square foot house. The Chapter obtains the land and the building materials, the permits and licenses, and provides essential construction expertise. The skilled trades which require licenses will be hired by the Chapter. Once everything is in place, construction begins and that is the really fun part. Day One and Day Two are the best. In our Chapter, we are sorely disappointed if all the walls are not standing by the end of the first day. Roof trusses are usually scheduled on Day Two and the rest of the work proceeds from there. One of the real joys of the construction time is working with the family who will live in the house. A requirement for purchasing (that’s right — purchasing) a Habitat House is the sweat equity investment. Before we will sell the house to a family, they must put in 250 hours (logged in and out) working on either their house or someone else’s Habitat house. Plus they must attend a 50 hour course on financial management as taught by Dave Ramsey of radio fame. Once they have made the hours and completed the course work and shown they can handle the payments, then we sell the house to them for the cost of materials and land. We provide a twenty year mortgage at zero per cent interest. At the end of twenty years, the house belongs to the family with no further obligation to Habitat. But then, you ask, if the materials are furnished by the sponsor, and the labor is all volunteer, why is there a mortgage? The answer is that we take the money which comes in from the mortgages, pay a minimal staff, and then use the rest as seed money to build more houses. It is somewhat like a benevolent Ponzi scheme. Our Chapter for instance has built about 125 houses so we have around 125 mortgage payments coming in each month. Larger Chapters have built 1500 or more houses. Habitat works all around the world. In fact, as a salute to our Christian beginnings, we tithe our monetary donations. Turns out you can build a house in Guatemala for about $3000. As a result, Habitat International recently celebrated construction of its 500,000th home. Corporate Donors also step up constantly. For example, Whirlpool Corporation donates a stove and refrigerator to every single house built in America by Habitat. When we finish a house, we call Whirlpool and they send them out. That’s why I buy Whirlpool every chance I get. Blessings on them and hundreds of others who do likewise. How do you fit into this scheme? Call your local Chapter and see what you can do. Start by showing up on the site one day to offer your labor in construction. Look around and see what they need. What you will find is a bunch of good people doing something they love for the benefit of someone who will never have a home any other way. Match your skills to their needs and it will be a good thing for both of you. Go do some good!! 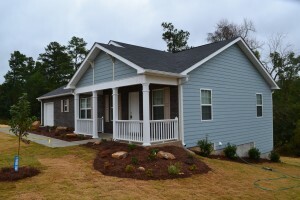 Our latest house, sponsored and built by employees of Delta Airlines in Atlanta.